For the uninitiated an Initial Coin Offering, or an ICO, is a way of launching and funding projects. Similar to an IPO, a portion of the supply of your new cryptocurrency is sold to fund operations. Unlike an IPO which accompanies an existing business, ICOs usually raise funds to then go about building a product or community. ICOs confer a different set of rights to their participants, mostly around access to some network resource, or the right to perform some form of governance. Vince Kuraitis and I reviewed the performance of healthcare ICOs in October, and well, it wasn’t pretty. This article builds on that previous work. It reviews the performance of healthcare ICOs to date, looks at their different token models, what platforms they are building on, and where projects are located. Another healthcare ICO has been listed since October. But the over all listing rate, and thus liquidity to token holders, is low. The performance of Healthcare ICOs remains poor. Every listed ICO has produced negative returns and several healthcare ICOs have lost over 90% of their value. Several tokens are moving beyond the “payment token” model and experimenting with new mechanisms to create value and drive participation. 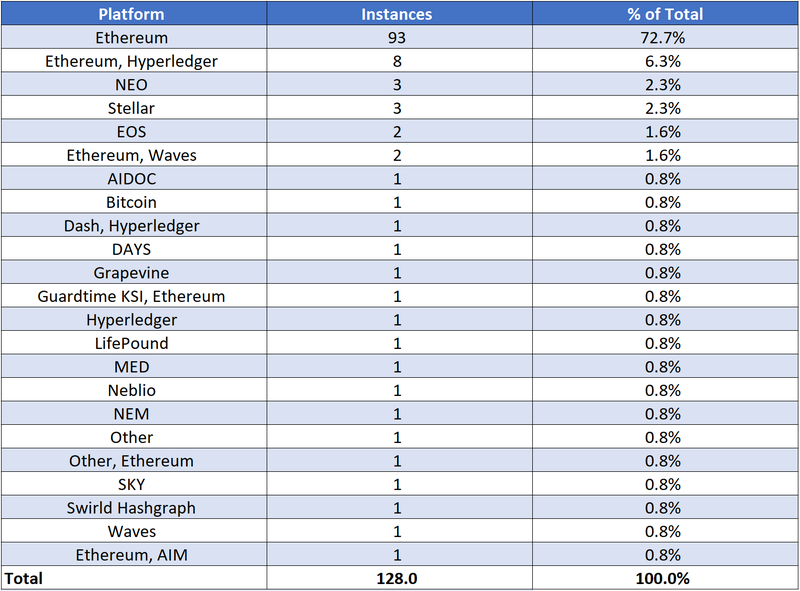 Ethereum is by far the most dominant platform. The US is by far the most dominant country for healthcare ICOs. 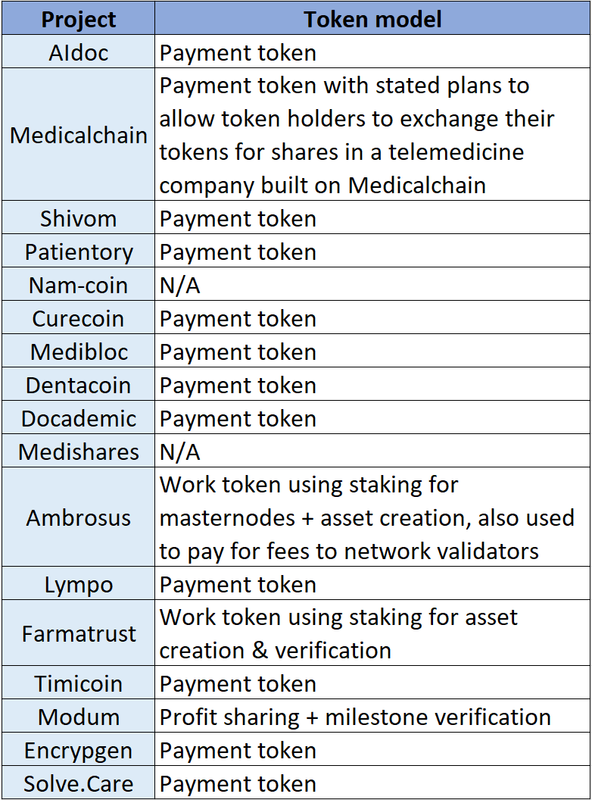 147 healthcare ICOs were catalogued from a variety of public sources. Most importantly, Vince Kuraitis and the Center for Biomedical Blockchain Research (“CBB”) independently crowdsourced lists of healthcare ICOs. These were crosschecked and filtered, before also searching through resources like ICOBench. Other data about these projects, such as the funding or where a project is based, was assembled from a variety of sources, including press releases, ICO listing pages, and team’s public statements. There were other gaps in my data set and sometimes there was conflicting information on particular data points. Moreover, some projects removed information about their token or their whitepaper, in the extreme case websites went down and all communications ceased. Regardless, every attempt was made to ensure this data was correct and I believe it is representative of the market overall. 17 out of 147, or just over 11% of ICOs received listing on an exchange compared to an industry wide rate of 15%. Listing are important for ICOs because they give provide liquidity to onboard new users and exit old investors. However, there are some reasons an ICO might want to wait to be listed. Exchange listings are expensive, market conditions are still dismal, there is still a degree of regulatory uncertainty, and perhaps projects want to ship a product before they list. It’s impossible to tell from the outsider whether a project has willingly decided to wait for a listing or has tried and failed. Moreover, those ICOs which have been listed have had terrible returns to date. 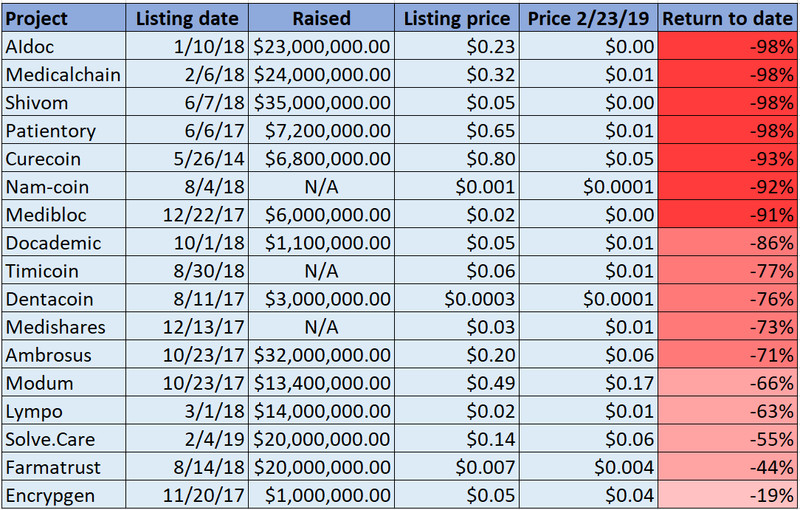 On 2/23/19 every single listed healthcare ICO has produced negative returns. All but two had at minimum halved in value, and seven had lost 90% or above of their value. The reserve asset of the crypto space, Bitcoin, is down 81% from its all-time high, puts these numbers in perspective. Though Bitcoin has orders of magnitude higher market capitalization, liquidity, and community base. Broadly healthcare ICOs have followed the overall market, with a slight decoupling in the past few months. While Bitcoin and Ethereum churned sideways, healthcare ICOs generally continued their descent, along with a commensurate decrease in volumes as well. This could be interpreted as the market becoming more efficient and evaluating healthcare ICOs as relatively more risky than Bitcoin/Ethereum. In a work token “a service provider stakes the native token of the network to earn the right to perform work for the network.” The fact that you are staking a token temporarily locks up some supply, which all other things being equal, would lead to a higher token price. It also provides the opportunity to punish network participants for dishonest behavior by taking away their stakes. To demonstrate the difference between these two, consider Patientory and Filecoin. In Patientory’s model “in exchange of PTY tokens, users will be able to use the network to rent health information storage space,” Patientory’s token is used as a medium of exchange, with no further utility or mechanisms in this model except for the ability to transact in it. In contrast, in Filecoin’s model service providers contractually commit to storing data for a period of time, and they need to stake a certain amount of Filecoin in order to do so. In the case that a service provider reneges on their contract, they are penalized and some of their staked tokens are taken away. This has the dual effect of helping to keep participants honest and reducing available token supply. A few tokens did not fall cleanly into one particular category. For example, Medicalchain has stated its intention to allow users to exchange their utility tokens for security tokens which represent shares in a telemedicine company built on top of Medicalchain. The best analogy I could come up with for this is the token represents an option to buy a share at an unknown price at an unknown date. It seems Medicalchain’s token will retain its role as a payment token in addition to this. Further, Modum’s token holders receive dividends, paid out by the company that maintains Modum, as well as giving token holders the ability to vote on whether or not the company has met certain pre-defined milestones. In part this is like a traditional security without the voting rights that come with shares, and it also has attributes of a governance token, except the only governance you can perform is to vote on whether or not the company has met its milestones. None the less, these blurred lines are generally a good thing. As an industry we really have no idea how to create long term sustainable value with cryptocurrencies. The more experiments we have on going the more likely we are to find something that works. Ethereum is by far the most dominant platform in the space with a huge lead over the next closest competitor. Projects building on top of it also captured the vast majority of the fundraising. It’ll be interesting to watch how this dynamic develops as other smart contract platforms launch as well. A note, several projects said they were using a dual blockchain structure, in 8 instances Ethereum and Hyperledger was listed as the architecture used. I have counted these as separate instances of both Ethereum and Hyperledger being used. As a result of the nature of ICOs, a public permissionless ledger must be used for the purposes of raising an ICO, though you might migrate your tokens off the public ledger in the same way projects like EOS have. As such, for these projects, no ICO could use Hyperledger alone. A few projects also expressed their intent to move to their own blockchain as well. For the purposes of this analysis I’ve included projects with residence in the Isle of Man, Guernsey, and Gibraltar in the United Kingdom. It is worth pointing out here that the two sources I relied most heavily on, Vince’s spreadsheet and the CBB’s database, almost certainly reflect an American/Western bias. 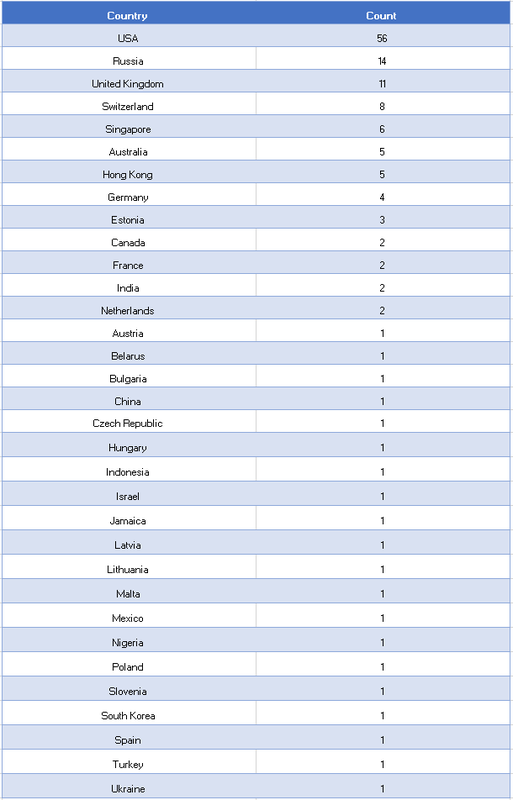 Still yet, it is remarkable how few healthcare ICOs in Asia there are given the high levels of interest in cryptocurrencies there is in China, Japan, and South Korea. It is also worth stating that teams may choose to incorporate in one place and operate in another for legal reasons, and it is difficult to tell where a team is really based at times. I tried to reflect where teams were actually based, not just where they were incorporated at. Regardless, my data showed a substantial lead for America, which is curious given the regulatory environment here. Other emergent hubs are relatively unsurprising; Russia, Switzerland, London, Singapore are all blockchain powerhouses. After my previous research with Vince I wasn’t surprised to find that healthcare ICOs were performing so poorly. We are deep into a bear market and everything is down. I was surprised to find that in these depths a new healthcare focused project, Solve.Care, had successfully conducted an ICO and was listed. My intuition is that ICOs are here to stay, but they will be much more sparse and will have to develop significantly from the model of 2016–2018. Specifically future ICOs will show much more experimentation and sophistication in their token models, and confer more governance rights to their holders. A project that I think got it right is MakerDAO. Returning to healthcare, in the short term there is the most potential for meaningful adoption in existing business networks. This is in tension with the consumer focused nature of ICOs and it’s not clear to me that consumers will want to participate in an ICO if it’s not something that gives them utility. Can you see someone buying into an ICO focused on something like provider data management? I can’t and healthcare incumbents are likely to stay far away from ICOs. Consumers might be interested again by new EHR projects, but given the saturation of that market already I’m skeptical. As a result, I think the healthcare ICO market will be weak moving forward. One area that I think could prove different is fitness or wellness focused projects. There aren’t the same incentive problems and regulatory barriers here as other parts of healthcare. Moreover, it is consumer focused and fitness can stir people’s competitive impulses. Combine that competitive nature with some innovative token mechanics and you might just have a winning project. If you liked what you’ve read, I’d really appreciate a follow and round of applause!